My first antique motorcycle was a 1912 Indian single, which I restored and rode to high school. These aren’t too fast, unless they’ve been reworked by Roy Burke, but I didn’t know Roy in those days. My second old bike was a two cylinder JD Harley, which was twice as fast as the Indian. It was only natural for a young man to conclude that a four-cylinder bike would be even faster than a twin. Although I’ve since found out it is not necessarily true, those “four-bangers” have always fascinated me. 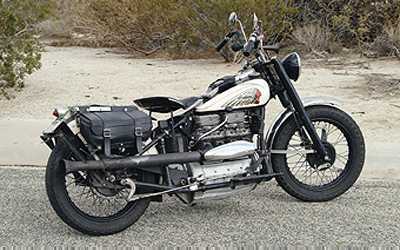 At the Borrego Springs National Road Run last spring, an opportunity presented itself to evaluate a pair of bikes with four pots, one British, and one American, the Ariel of Jim Moore, and the Indian of Max Bubeck. The Ariel Square Four was the brainchild of Edward Turner, whose greatest fame came from the creation of the Triumph Speed Twin, and its various derivatives. He designed the “Squariel” while working as a young engineer at Ariel’s Selley Oak facility. It was introduced to the public in 1931. Two vertical twins were geared together with straight cut gears, and counter rotating crankshafts canceling out the vibration inherent in a vertical twin. All four cylinders were in a common block. Overhead camshaft drive was incorporated in this sporty 497cc package. In 1932, the engine grew to 597ccs, and to 997ccs in 1937, when the more pedestrian push rod valve gear replaced the overhead cams. Anstey link plunger rear suspension was added, and after the war, the Squariel evolved further, with telescopic forks, an all aluminum top end, and four separate exhaust ports as on Jim’s Mk 2 version featured here. Early models suffered from overheating, but by the Mk 2 version, most of these problems had been defeated, and a true British “super bike” was the result. A Square Four presents very good value for the collector, as it’s arguably (almost) in the same league with the much more expensive Vincent twin. By the time the Mk2 was manufactured, other Ariels featured swing arm rear suspension, but the Anstey link plungers were retained on the Squariel, as it was primarily intended as a sidecar hauler in its British marketplace. Much derision is launched at the Ansteys, but they work well if in good condition and lubricated properly. Jim’s Ariel started first kick, after turning on the battery ignition, and smooth running was achieved through its side-draft Solex automobile type carburetor. One up, and three down via the lever on the right, and I was off, shifting very smoothly achieved via the four-speed Burman gearbox and clutch. One was aware of a lot of stuff going on under that massive gas tank, what with two cranks, straight cut gears, and various other things going up and down, around, etc. It sounded a bit mechanical, but not alarming in any way. The marvelous exhaust note soon drowned it all out when the throttle was twisted. Handling, ground clearance and braking were all good, and acceleration is very impressive. My only criticism was that it seemed rather low geared, but Jim had just acquired it, and wasn’t sure if it was fitted with sidecar gearing, which is what I suspected. I returned it after a spirited ride, and set out on Max’s Indian. I’ve ridden a few Fours over the years, and its been my observation that a good Henderson will blow an Indian Four into the rhubarb anytime, but I suspected this one could be a bit different. Max’s ’39 is a true one-owner bike, as Max has owned it since new. The later Indian Fours had the dubious reputation of having the lowest power to weight ratio of any machine available at the time, but Max soon set about correcting this basic fault. The rear fender was bobbed, a lighter front one was fitted, and the engine was breathed upon. Max claims all is “box stock,” but I know better, as I’ve listened to Max’s stories over the years. The rods are from vertical Indians, the carburetor and intake manifold are oversize, the exhaust system and cam are doctored up, and the archaic leaf spring forks are replaced by aftermarket “Vard” forks, which are telescopic hydraulic items pre-dating Harley’s “Hydroglides” by a decade. Max actually won the 1947 Greenhorn Enduro on this Four, a machine that is not exactly a “desert sled” with its long wheelbase, torque affected handling, foot clutch, heavy weight, and a pretty lightweight guy on board. What kind of line has Max been trying to shovel us all these years? I was anxious to find out.The Indian started first kick, no surprise here, and sounded a bit more throaty than others I’ve been on. A click into first, without the usual “clunk” as Max makes his own clutch plates, and I was soon down the road. The Vard forks made this the best handling Indian Four I’ve ever been on, and the power was most impressive. I was soon rocketing along at an indicated 85, and no doubt could have exceeded 100 mph with a simple twist of the left hand throttle. The sound from the modified exhaust was impressive without being antisocial. I returned the bike to Max, and realized that if I were to take this one on, with a Henderson, I would have to borrow a six or eight cylinder version from Carl Vandre to make a serious attempt. Well done, Max! It’s unfair to compare these two machines. They hail from a different decade altogether, and Max’s Indian has had the ongoing love of one owner since new, while Jim’s Ariel is a bike of uncertain parentage acquired at a recent auction. Both have a lot of personality, a great sound, and would make any owner happy. The Ariel’s four-speed box, foot shift, and hand clutch are a better setup, but that’s a more modern concept. Thanks to you both for a great day with four cylinders!